Mika is 10 years old and was picked up by the dog warden and ended up at the pound, although to be honest, this was a blessing as we then took her under our wing. Her ears were in a disgusting state, to which she's been to the vets every week to get them cleaned. They are now sorted. She's not great on her back legs, but this could also be down to muscle wastage. Since she's been in kennels, she's probably looked the best she has for such a long time. She gets very excited when she sees other dogs and a little vocal. She will snap at them if they get to close. She's probably not been well socialised either. She likes the odd toy and does come alive when you start to play with her. She's either hard of hearing, or previous owners never interacted with her so she lives in her own little world. 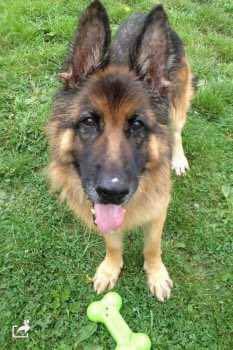 There must be someone out there who can help this lovely old girl, she is desperate to get out of kennels and have some 121 attention.